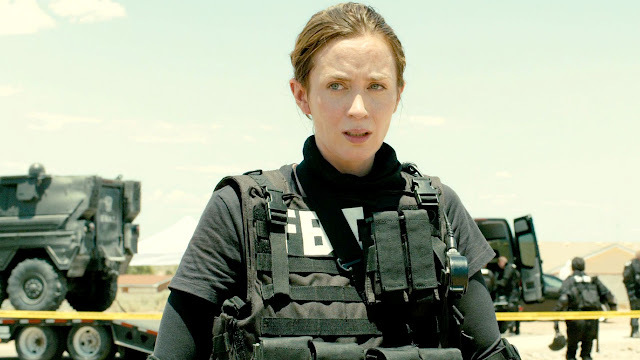 Prisoners director Denis Villeneuve continues his string of interesting, moody dramas with the drug war thriller, Sicario. It's a tense, often viscerally brutal film about law enforcement and duelling senses of justice on the American-Mexican border. What the film ultimately captures is the human toll and emotional cost of constantly battling the drug trade. Emily Blunt is electric as an Arizona FBI agent used as a pawn in the interagency battle to take down the Mexican drug cartels as she follow a mysterious federal agent played by Josh Brolin and the mysterious Benicio Del Toro. Blunt is constantly beaten down physically and mentally as she's put through the gambit of punishment and anguish. In contrast, Del Toro gives a restrained but tour de force performance as a fixer with unknown affiliations and motivations. Cinematographer Roger Deakins gives Sicario a muted lush of greys and blues as scenes of tension pop without ever distracting. Everything contributes to the morally loose sense of violence where the feds and U.S. military break bones with little to no oversight as the violent drug war rages on. Blunt's Kate Macer, clearly out of her depth, gets lured into the seedy cartel world of Juarez as screenwriter Taylor Sheridan's script explores the ethical complexities of combating the violence. Sicario is a gripping and unsettling journey packed with understated yet powerful performances. Blunt and Del Toro, in particular, provide satisfying back and forth drama. Villeneuve shows his impeccable control of the camera and performances as Sheridan's script is loose enough to let the actors play while maintaining enough thrilling moments of suspense throughout.